For just £1 a week, you'll have 100 chances of winning a weekly cash prize. This includes £1,000, £200, £150, £100 and £50. You will also be automatically entered into our Quarterly Super Draw Raffles with a fantastic top prize of £5,000. The Cats Protection Weekly Lottery is a great way to show your support for cats and kittens in need. For as little as £1 a week you could pay for nutritious food for a starving cat. You could help us vaccinate cats against life-threatening illnesses such as Cat Fu, Enteritis and Leukaemia. 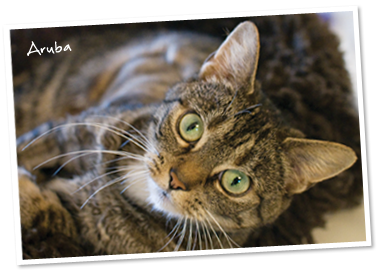 Or you could help us provide emergency veterinary treatment for a cat like Aruba. Aruba was found by Cats Protection with her litter of one-week-old kittens in a rubbish box. She was starving, distressed and in pain due to an injury caused by an ill-fitting collar. Aruba’s injury was so severe our vets rushed her in for an emergency operation. After several weeks of recovery Aruba and her kittens were ready to find their forever homes with loving new families. By taking part in our Weekly Lottery, you can help us care for more cats just like Aruba – every single week. Will you join us today? You must be aged 16 or over to join the Weekly Lottery. To play you can enter online and pay by monthly Direct Debit. If you would prefer to pay by credit/debit card or cheque/postal order, you can enter over the phone by calling our Weekly Lottery Helpline on 01628 825 928 (lines are open Mon–Fri, 9am – 5pm). Click here for full terms and conditions.